Well, we hope you enjoyed your first foray into the round of Saintly Kitsch. If you didn’t, that’s a shame since we’re all kitsch, all the time here at Lent Madness for the rest of the week. Yesterday Frances Perkins continued her Cinderella-like run through the bracket defeating Jonathan Daniels in heavy voting to earn a spot in the Faithful Four where she’ll face either Hilda of Whitby or Harriet Tubman. Today it’s another trailblazing woman facing off against another modern martyr. Florence Li Tim-Oi made it to the Elate Eight by stomping on Chad of Lichfield in the most lopsided match-up of Lent Madness 2013 and then sailing past Gregory the Great. Oscar Romero emerged victorious in his two previous battles soundly defeating Elizabeth Ann Seton and trouncing Lucy. To which we respond: Kitsch, like Lent Madness, is serious business. Also, we’re never funny. We leave that to circus clowns and cats making funny faces on Facebook. First of all, both members of the Supreme Executive Committee use Macs so the statement “Obviously PC has governed both the brackets and the voting” is impossible. Secondly, there are two untouchable in Lent Madness — you will never see Jesus or Mary in a bracket. Finally, we prefer our saints to be hell-raisers (like John Donne) not chicken-raisers (like whatever you’re referring to). Finally, check out Maple Anglican’s Lent Madness video of the day as the Archbishops preview today’s match-up and answer viewer mail. This much beloved daughter of Lent Madness was baptized as a student and took the name Florence, in honor of Florence Nightingale. She was the first woman ordained to the Anglican priesthood on January 25, 1944. This is her beautiful icon. The Celebrity Bloggers prayerfully celebrate and thank Florence for her witness and courage as she paved the way for women’s ordination by her faithful ministry and witness. However, Florence has no saintly kitsch. None. Nada. And believe me, if the Celebrity Bloggers and the Supreme Executive C ommittee couldn’t find kitsch, it simply does not exist. So, bewailing the lack of anything resembling kitsch or even things oddly funny (we found a calendar, but it was just, well, a calendar), the snark triumvirate of Fr. Tim, Megan, and Laurie combined their respective superpowers and give you the best we have: Famous Flos. Florence, Italy. The birthplace of the Renaissance, the home to the Medici family (which weren’t all that honorable like our Florence, but they did support many starving artists), and the place where the monk who lambasted immorality and greed (especially in the church) Savonarola was killed and Machiavelli, the political thinker, wrote The Prince. Florence, Kentucky. It has this awesome water tower. Florence Jean Castleberry is noted for her servant ministry. Born in Cowtown, Texas, to Edsel and Velma, she dropped out of school at 16 and subsequently married three times before finding her true calling as a waitress at Mel’s Diner. She became a confident and spiritual director of many patrons and fellow waitresses alike, most notably Alice. Flo (as she was known) eventually returned to Cowtown and bought a roadside juke joint, naming it Flo’s Yellow Rose. 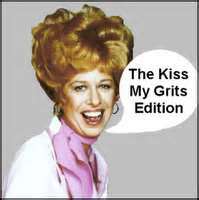 Her main liturgical response to many men and women is, “Kiss my grits.” Flo’s alter-ego, Polly Holliday, is an active member of the Episcopal Church. Florence Henderson is best known for her role as Mrs. Brady. She was married before and had three daughters, but her former husband was apparently abducted by aliens, as he was never mentioned in the series. Mrs. Brady married Mr. Brady and this group would somehow form a family. That’s the way we all became the Brady Bunch. The Brady Bunch, The Brady Bunch. That’s the way we became the Brady Bunch. You’re singing the theme song now, aren’t you? It will be in your head all day long. You’re welcome. Florence Nightingale Also a saint, this Florence was born in the afore-mentioned Florence, Italy in the early 19th century. She became a nurse and volunteered to serve as a nurse during the Crimean War. Her strict approach to cleanliness and sanitation drastically reduced the death toll in field hospitals, and her leadership and innovation elevated nursing into a profession. Nursing Florence, we might add, has kitsch, like this Andy Warhol-esque tote bag, because…why not? Yes, yes, we KNOW about Florence + the Machine, about the Jefferson’s maid Florence, and a few others, but we do have day jobs. Sort of. The RELICS: There are first-order relics. When Romero was killed, he was celebrating mass at the cancer hospice where he lived. His vestments have been preserved, and can be viewed in San Salvador, (or online, at the Romero Trust, here). His body, on the other hand…. So we know Romero was killed by a death squad member. But we don’t know who. And lo these thirty years later, we still don’t really know for sure. (Though, there be many theories). After his death, his funeral was held on Palm Sunday, March 30 (appropriate.) It was a huge event, with thousands flocking to the cathedral, and TV crews broadcasting it around the world. During the service, the army threw smoke grenades into the crowd, then opened fire on the mourners. Over 40 people were killed by the end. The service was never finished, and Romero ended up hastily buried under the cathedral. 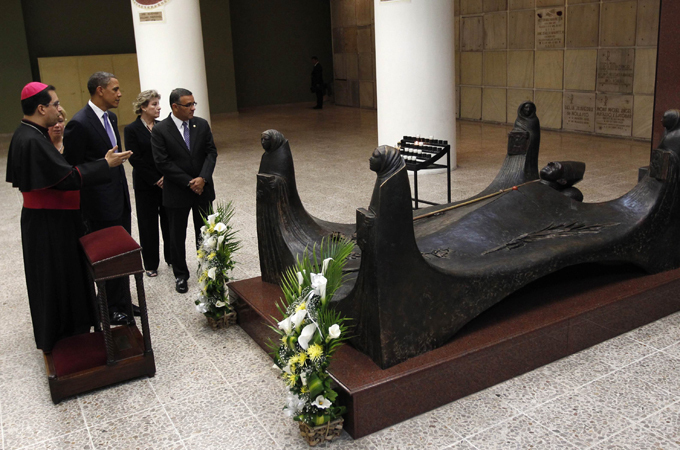 When Rome recognized that there was a case for canonization, Romero was re-buried in a nicer (read: an actual) grave. As the government feared, this site has become a place of pilgrimage for many, including Pope John Paul II, and President Obama. The MOVIE: Romero, with Raul Julia, made in 1989. Gomez Adams, as you have long wished to see him! (The whole thing can be viewed in really bad quality on YouTube. Or, if you wish, it is also available on Amazon, as are all things, save salvation). It is very heartfelt, and quite moving. Fortuitously, the casting of Raul Julia means that the saint Romero is name-checked in Mystery Science Theatre 3000: Overdrawn at the Memory Bank, a movie ALSO starring Raul Julia. Yes, even Tom Servo and Crow know and appreciate the good archbishop. The MUSICAL! And not just any musical: a children’s musical. Here, at long last, is an activity for that bored Sunday School class! Awesomely, when you buy the rights, the music or the backing track, the proceeds all go to development projects in El Salvador. There are SONGS! Namely, the Martyrs’ Project has a rather good song, with lyrics entirely taken from the Archbishop’s sermons and prayers. The video is here (scroll to the bottom), and is also comprised of footage of that time of war. There are STATUES. Like at the National Cathedral and Westminster Abbey. While the Roman Catholics may be late to the game in even officially proclaiming Romero a martyr, we Episcopalians have no such compunction. Martyrs are martyrs, y’all. And, of course, there are T-SHIRTS, BUMPER STICKERS, MURALS…. In all seriousness, Romero’s face has become as recognizable in Latin America as Washington’s or Lincoln’s is to us here in the United States. He truly does live on in the Salvadoran people. 119 Comments to "Florence Li Tim-Oi vs. Oscar Romero"
Thanks for link to beautiful picture and to foundation. Thank you for the info on Florence’s dahlia! Of course, I want to buy one for my garden! I had meant to vote for Florence Li Tim-Oi, but today find I must vote for Oscar Romero, a bishop who did not fail his people nor leave them on their own, but spoke their names and blessed their struggle. Women priests get my voice. This one is for you , Alice. The tomb of San Romero de las Américas that Lent Madness readers see in today’s posting is the THIRD one for the poor man who has been dead not quite 33 years (this Sunday, Palm Sunday, will be the actual anniversary). The first tomb, in the crypt of Catedral Metropolitana in San Salvador, El Salvador, was extremely simple, intended to diminish Romero’s importance. 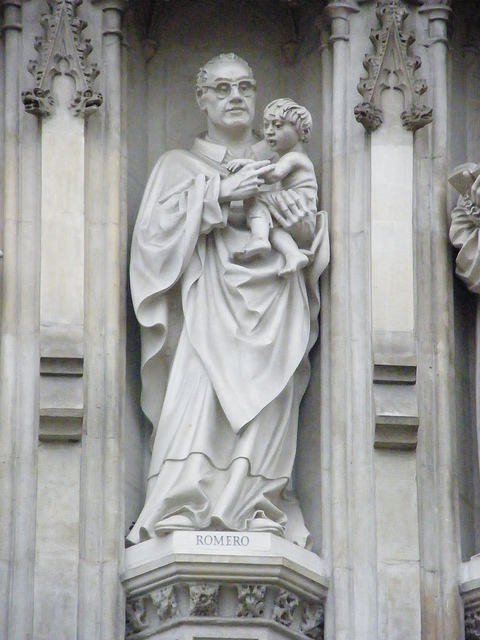 Then, Romero’s body was translated to another place in the cathedral crypt, a side alcove. This second tomb truly became the people’s tomb: every time I would visit it for my prayers, I would see lots of people praying there, their hands or sometimes faces on top of the large rectangular tile-covered tomb. People would place flowers and palms on top. On the adjacent wall were the words from the Gospel of John, ‘… unless a grain of wheat falls into the earth and dies, it remains just a single grain; but if it dies, it bears much fruit’ (Jn 12.24). In 2005, on the occasion of the 25th anniversary, the powers that be decided that the second tomb was too ‘popular’ (i.e., of the people), so they hired an Italian sculptor who designed and executed the current tomb. Romero’s remains were moved, then, a third time, and the ‘new’ tomb was dedicated on 24 March 2005. The authorities roped it off, hoping that the people would not venerate Romero as much, but the people have ignored the ropes and continue to place flowers on the tomb. The tip of Romero’s mitre has gotten burnished from people touching it. I much prefer the second tomb but it doesn’t really matter because Romero’s spirit is not in the crypt, it is in the streets with the people. So… there is your trivia (about what I consider a kitschy tomb) for the morning. Oh, and during the 1990s, you could not find tshirts, posters, postcards or anything related to Romero. Now his image is becoming domesticated by all the kitsch. Never fear, no matter how much they try to domesticate Romero, they will never succeed. As he said, “Let my blood be a seed of freedom” and “if they kill me, I will rise again in the people of El Salvador”. Pax. I was all set to vote for Flo (“Kiss my grits” was a very important part of my childhood) but I was stopped by a significant fact from Lee: ” the poor man who has been dead not quite 33 years (this Sunday, Palm Sunday, will be the actual anniversary).” Wait, he was buried on Palm Sunday, and this Palm Sunday will be the 33rd anniversary of his death? Folks, I don’t believe in coincidence, and the variety of dates that Palm Sunday can fall on makes me believe this is Oscar’s time. I love Florence’s witness, and with sincere apologies to Flo/Polly I believe I am meant to lift up our brother Oscar closer to the light of the Golden Halo. Molly R., my writing was not clear. This coming Sunday, 24 March is the anniversary. He was no buried on Palm Sunday, though. I would just like to say, one of the reasons I truly enjoy Lent Madness (besides learning about all these amazing people which is my #1 reason) – is that the writing is so refreshing. Regardless of what anyone says, I believe all the bloggers and the SEC are extremely talented writers who provide intelligent, researched and well thought out commentary. It is amusing and yet informative. And always in a respectful way. Thank you for that….I wish there was more of that out there in the WWW. 🙂 Happy Spring! You know you are correct — the writing is good, they are talented writers who were providing informative information up until this Kitsch stuff. This is just silliness. I have no problem with that, but if this is truly to be a tool to educate people, the sarcasm and the “cuteness” gets a bit hard to take. I have stopped making the copies for the notebook I have by my poster in the gathering space. It is not informative, it is demeaning. I also tend to agree that political correctness does seem to win out. Mostly contemporary people, all good, but our history has meaning as well. I do not appreciate the kitsch since it seems to denigrate the “saints” . Guys. Lighten up. Do you think the saints themselves had no humor? Laughter is a gift from God too. Well said, Dana and Natalie. Thanks. Although I am sure that Oscar will get the nod, as a nurse, I had to vote for Florence in solidarity with Florence Nightingale. Paving the way for future women priests isn’t a shabby accomplishment either, despite the lack of kitsch. Maybe the lack of kitsch will create a backlash of votes from kitsch-haters. Hmmmmmm. I have been serious long enough. Seriously. So today, my reason for choosing Florence Li Tim-Oi is this: my grandmother grew up in Florence, SC and moved to Hartsville, SC as a bride. When the Great Depression hit, she and my grandfather and four children left their large town home, moved out to their farm where they all worked hard every day, and with their savings, she bought two hotels in Myrtle Beach and named them The Hartsvilla and the Florentine. That was way back when M.B. was a sleepy little town with hotels open only in the summertime. I was named for her and spent my childhood summers at The Florentine. 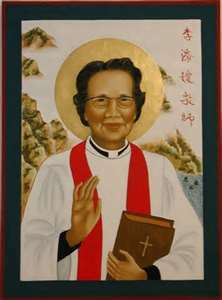 So Florence gets my vote in serious admiration for two holy and very hard-working women: my grandmother and The Reverend Florence Li Tim-Oi, priest of the Church. “To each of us Christ is saying: If you want your life and your mission to be fruitful like mine, do as I. Be converted into a seed that lets itself be buried. Let yourself be killed. Do not be afraid. Those who shun suffering will remain alone. No one is more alone than the selfish. But if you give your life out of love for others, as I give mine for all, you will reap a great harvest. You will have the deepest satisfactions. Do not fear death or threats; the Lord goes with you.” April 1, 1979 go with Oscar! This theory might work for today . . . probably not if he faces Frances Perkins in the final bracket. I agree with you Sr Mary Winifred. I think the big Lobster folks in conjunction with the folks at Department of Labor will make Hawaii’s efforts for their Emma last year pale in conparison. When FP’s name is up there are a whole lot more people out there suddenly voting. I found Christine’s quote of Romero (above) utterly compelling. Thank you, Christine! I just copied down that quote by hand because it is so beautiful. This is so hard! Both of these persons of faith are important, highly important to me. How can I choose? And yet I must. I said before that I would never vote against Abp. Romero, and so it is again today. But I am filled with regret voting against Li Tim-Oi! Don’t you think the other two were aware of their danger? Though I also went with Romero. Oh most certainly Daniels and King were aware. They could not have missed it. My point is that there is a difference between dying unexpectedly at the hands of a coward and in facing evil head-on, having an opportunity to renounce your faith and (possibly) walk away, then deciding to carry your cross into the Monster’s jaws anyway. Harder and harder to choose. Today it comes down to voting for someone who was born a saint and someone whose heart and mind changed in the course of his life. I will vote for Romero, but perhaps I’m really voting for all those who have been and will be willing to be changed by God’s grace. My bracket had Romero. Then, I wavered for Florence (in honor of my nephew moving to Canada and a brave lady), but in the end, the bloody vestments did it. Romero has my vote. Disturbing as the pictures were, they make his sacrifice and the sacrifice of other martyrs (like Jonathan Daniels) more real – touching the heart rather than just the head as if only some historical topic of conversation. Nicely done article, Megan Castellan. Also, thanks to Lee (above) for the additional information. You can find some treasures amidst these comments. Hardest matchup of the whole season for me. Both are significant inspirations to me in my priesthood. Both bore amazing beyond-human witness clearly sustained by the Holy Spirit. But I have a more personal connection to Romero, having been in El Salvador for the commemorations of the 30th anniversary of his martyrdom and having seen the various relics, sites, etc.–all the spring before my ordinations. Also: what slfiore above says about the transformation in Romero’s life from backer of the status quo and friend of the oligarchs to radical witness to the Gospel and martyr and how much hope that gives that others may also be changed, perhaps even me. I’m sitting in the airport awaiting my flight from Pennsylvania to the Caribbean, leaving the 20 degree weather behind. And yet it is bittersweet. I fear that I may venture out of Internet range and thus suffer from LMW. Perhaps next year the SEC will make absentee voting possible, but until then, I must take courage from the saints to get through this terrible ordeal. Happy Lent, and God bless you all. Having just returned from a warm respite, I understand your angst. Was lucky enought to connect, read, ponder and vote each day- keeping my Lent holy. The idea of absentee ballot did cross my mind before the saving wi-fi connection clicked on. Take courage in Jamaica-all shall be well. Never fear, I’ve been voting from Chiang Mai, Thailand. There must be a kicky long-distance award, na. I missed voting yesterday because I was planning on voting shortly before 8 a.m., because I was having a hard time deciding, but forgot Lent Madness uses EDT instead of CDT. Anyhoo, now I’m stuck again. I’ve known all about Florence longer than I’ve known about Oscar. I would love to see her with the Golden Halo, but Oscar is deserving too. And I’ve voted for both in previous rounds. Coincidentially, I’m going to hear a contemporary of the Archbishop speak in chapel on campus today. (The Rev. Rogelio Ponseele who you can read about at http://www.mennoworld.org/blog/2012/12/28/challenge-manger-bethlehem/?page=2 ). So I plan to vote after lunch. Oh and y’all forgot about Florence, Oregon, the home of sea lions and costal sand dues. And I didn’t know Mrs. Brady’s alter-ego was an Episcopalian, but I’ve shared a communion rail with housekeeper Alice’s alter-ego. Despite the lack of kitsch (like I said at the beginning…the Lentorium could make a mint producing it’s own kitsch – besides the LM mug), I still am backing Flo. Not that I’d really cry if Romero won, as he is also very deserving. Besides, you have to admire Flo’s CB+ for trying while under a clear disadvantage. Florence, Florence she’s the one! 😉 However, Oscar did great things, but Oi, I’ll go for the numero uno woman priest! BTW, I’m sorry about “The Quitter.” Sorry they are going to miss out on a challenging race with the best of the BEST clever kitsch raisers! That was the greatest picture of Jesus enjoying the humor too… What’s after Lent Madness? I’m already hooked, so another follower of Forward Movement is born! JenniferThomasina, the first part of your comment–very witty! The second part–very true. So ….. CREATE some kitch for Tim-Oi already! It’ll obvious sell!!! You’re not trying to be funny. The site is brilliant, funny, witty, educational. Love it! Agree about the PC comment. My husband is countering that by only voting for old, dead, white guys! Jonathan Daniels got robbed!! LINT MADNESS today in my dryer! Like so many others on this board, I found today’s match-up the most difficult yet. I have so enjoyed getting to know Rev. Flo, and will continue to use her as a “she-ro” in the women’s spirituality seminar I teach. 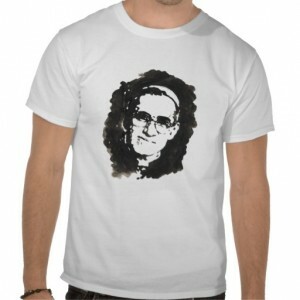 Nonetheless, today I must vote for my inspiration, Saint Romero of the Americas. He has been my exemplar for years of a true witness for the faith, so I could not forsake him today. Chicken-raisers? CHICKEN-RAISERS?!? Well, THIS chicken-raising ecological permaculturist feminist farmer-pastor is voting, so if that upsets some folks, well, y’all will just have to deal. Today, with the deepest of respect to Florence Li Tim-Oi, I cast my vote for Oscar Romero. His life was a profound witness and his actions and beliefs have been a guide and inspiration for mine. The deciding factor had nothing to do with kitsch–it was yesterday’s article by George Monbiot (do a web-search on his name and “Cardinal Sins” to find the article). In honor of Romero and all the other liberation theologians that Popes Benedict and Francis have tried to silence, I vote for Saint Oscar today. La Lucha Continua!!! Thank you so much for the reference. IT IS WORTH READING THIS EVERYBODY! Lent Madness commenters have been my Lenten study. thanks Y’all. This gets harder and harder. I remember reading once that Romero was murdered right after reading the announcements to the parish, a seemingly innocuous exercise we all did thousands of times almost without thinking. But he included something (my memory fails me here) the authorities found unacceptable, so bang! you’re dead! Our calling as clergy gets us into lots of tight places, but we know that it will, don’t we? Rarely do we suffer literal martyrdom, though. I think I have to go with Romero, however reluctantly. No offense to either him or Flo. 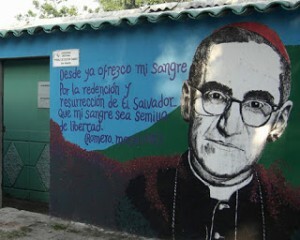 Happy to vote for Oscar Romero today; I love that wall mural, and now I’m thinking “That’s the face of the church I love to see.” Religious, compassionate. Thinking of becoming Catholic later…. You can be Catholic without being Roman you know . . . consider trying Anglo-Catholicism first before swimming the Tiber. And just a reminder that Ann B. Davis who played Alice the maid on the Brady Bunch is also a very faithful Episcopalian! I loved the icon of Florence, her sweet countenance and smile belying a strong spirit, hardened by her strength of will in the face of opposition. AND, she’s a priest, an Anglican priest, the first woman priest who wouldn’t quit trying (as opposed to the “other” church which has no women priests at all). I vote for Florence, a lovely lady herself. Florence doesn’t have a musical, exactly, but the “The Light in the Piazza” is set in Florence and even includes a much beloved daughter. Here’s the opening number as performed at the Tony Awards: http://www.youtube.com/watch?v=_ikqeG4ab3Q. Florence Li Tim-Oi is a beautiful, deeply inspirational woman–her secret priesthood, her endless faith, her unwavering courage. I am so glad to have met her. I thought she’d be my pick today. But Oscar Romero’s life and words are powerful. I agree with Sheldon–neither is “better.” And like slfiore, I’m moved to vote for Romero for the way he embraced the grace of profound change. Actually, I collect saintly kitsch – 3rd class relics which (as everyone knows) are something that has touched a 1st or 2nd class relic. Going to Hawaii for spring break next week – hope to touch a copy of her portrait to her tomb. “Her” in the previous post being Queen Emma, last year’s saintly runner up. I have to protest the abuse of chicken raisers. I raise chickens and provide my neighbors & friends with fresh pasture-raised eggs. Neither I nor my girls (hens) stink, thank you very much!! Now, big ag egg farms are a different story, but surely none of these wonderful saints would participate in something so ugly!! Chickens are fun to raise. Their eggs are delicious and I love to share them with family and neighbors. While I prefer very local eggs, it is Big Ag who feeds millions of people. My daughter brought me a green stole from El Salvador with a portrait of the archbishop on it and I have a weakness for clergy who are murdered in the middle of celebrating the Eucharist. That said, I hate to vote against Florence and until today hadn’t yet. Oh well, it’s madness! Kitsch Krank here! !Lost mojo to vote…then read all the comments and became inspired..fabulous blog community..Voted Oscar Romero. Don’t let IQLM quit. You need us!! True that! LM offers up a daily helping of provocative, touching, amusing fat-free goodness. The saints–the ole timey sainty saints and the newer-minted color photo saints–witness this, golden halos already in place, with delight. Hang in there, ye who would quit. Vote every day, comment, share your passion, whether it’s ire or joy. LM needs kvetchers and kranks as much as it needs kitsch! Conversely, we in LM need IQLM to keep us seriously sober. Or, is it possible to be simulataneously silly AND sober during Lent Madness? Ha- yes! Caught me — I almost did – seriously! – when I found out there was no Li Tim-Oi kitsch to sully her story. Beautiful stained glass images and glorious dahlias don’t really count as kitsch IMHO — missing the tacky factor. Well, then neither should a statue at the National Cathedral count as kitsch! Oscar all the way today! Voted for Oscar. Betting (in my head, obviously) that he’ll go on and win the whole thing. Loved Li Tim Oi’s story and so glad she made it this far. Laurie, I am laughing so hard about the Florence KY water tower. I lived there during high school and remember when the tower was painted. It originally said Florence Mall, to landmark the brand-spankin’ new mall that opened next to it (and that was a VERY big deal). Someone objected to use of the name and so the frugal town officials decided to doctor the sign rather than repaint the whole thing and hence was born the infamous and very kitschy “Florence Y’all” water tower. And now, thanks to you, it’s achieved world-wide fame. Florence KY is now on the map! You’re welcome! I was glad to give a city in my diocese a shout-out! I’m glad it made you laugh. I say that laughter and tears are two of God’s favorite prayers (and some of our most honest prayers, too). I’m still scratching my head over yesterday’s vote. As a Methodist, I knew nothing about Florence and was glad to learn about this fine woman, but I must vote for Father Romero. By the way, why hasn’t John Wesley appeared in Lent Madness yet. Charles has but not John. SEC-look to you 2014 brackets. Poor Florence: loved by the people she served with courage and grace, but mostly ignored by the church once it became possible to replace her. Perhaps the best kitsch is simply the embarrassment of church leaders who couldn’t hide her away and had to own up to ordaining a woman as a priest. This spring I will plant a Li Tim-Oi dahlia in my garden. It will be my “golden halo” (red, actually) to her. I thought I would vote for Florence but I decided to vote for Oscar Romero. The comments were especially helpful today. Have been reading in “The Violence of Love” since beginning Lent Madness and voting for Oscar Romero early on, hoping he would “go all the way.” The book became my Lenten meditation book this year, unintentionally, but there you have it. The Holy Spirit at work. Must vote for Oscar Romero today. Love you Florence! Glad the Church Triumphant are praying for us down here when we grieve the ouster of one of our favorites. It’s hard to take. Not hard like when Arsenal are eliminated from the Champion’s League, but hard just the same. I tend to take these things very seriously, so I just remind myself that no matter what happens in LM, all the saints here have already won. Had to steel myself to vote “against” an Anglican, but I did it. I voted for Romero. Mainly because I’ll never have the opportunity of punching the faces of those who murdered him. Today it was Bp. Oscar, much as admire all women in the early struggles for ordination to the priesthood. PC (the attitude, not the computer) does seem to be running the show this year, but Hey! if that’s the criterion people want to use for voting, so be it. This is “Lent Madness”, there is no “correct” way to vote. Some cast their ballot after a day of careful consideration, others on a momentary whim. It’s all good! But I do agree with Holy Smoke, our history has value too. I am going to go with FLO. I was unaware of the chicken raisers in the bracket. I would have thought that information would have been prime blogging material given the fact that so many of us PC feminist ecologists are voting. If I had known this vital information, my votes perhaps would have been different. Shame on the SEC for keeping this kind of information from the voting masses. That said, I had to go with Romero today… and, now I feel badly for abandoning Florence. LM is going to lead to therapy. I read the story of Florence Li Tim Oi when she was in the initial rounds. Today I’m voting for Oscar Romero, despite my feminist tendencies. I have to say, though, that the kitschy details related to all things “Florence” do not provide a valid comparison to the virtually kitsch-less details about Oscar Romero. Vestments stained by blood and fear are not kitsch. I’m not dropping out. I haven’t had time to vote every day, and I expect the SEC has already composed the kitsch for the remaining saints in this bracket. As a result, this request may be too late: Drop the kitsch, please. You, from Alabama, left out Florence, AL, one of the tri-cities “up north.” Turn in your houndstooth hat! To the Lent Madness quitter: Get a life! As a Presbyterian then Unitarian who has finally found a home in the Episcopalian church, I thank you for bringing the amazing story of Florence Li Tim-Oi to my attention. She is an inspiration to me, and I am so thankful for her faithfulness, her dedication, and the story of her and pirates. 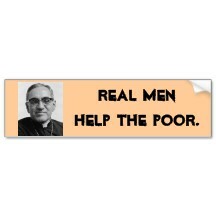 But today I have to just go with my heart, and vote for Oscar Romero. These brackets just get harder and harder! This Mac-using feminine, feminist Mc- and wanna-be chicken-raiser (I am trying to grow my own cauliflower), alas, was so moved by the Martyr’s project video and song, “Romero,” that I must cast my vote with Oscar. However, like my favorite politician, Hillary, I don’t think we’ve seen the last of Florence Oi yet. And I’m ordering her dahlia to plant alongside my cauliflower and boutique variety thyme once I’m done here. Parting shot: Perhaps if more real men just fed the poor, and helped them to feed themselves buy sponsoring them for flocks of chickens, instead of riding around in jewel-encrusted mitres and red shoes in diocesan (and papal) limos and bullet-proof phone booths, maybe the Universal Church would not be in the crisis it’s in now. Regarding “quitting”. I think that the way voting goes has a lot to do with what is going on in our culture at the moment…that is what influences who gets votes. I think that if you removed many of the violent acts that have taken place in the last months, or years, it may put us in a different place spiritually. I think, right now, that many are voting for the voiceless, the people who need to be held up in 2013. Luke needs no such support. He’s been around for ~2000 years, he’ll still be kickin’ it in 2000 more. He will speak to us forever. We need people, in addition to him, who speak to us TODAY. Grace and Peace, y’all! Voting for Florence. She put herself out in the firing line literally and spiritually for decades. Beautiful! Thanks for posting this! All this talk of PC suggests folks are making knee-jerk votes. That’s not my sense from reading the comments. No matter my vote, the best part for me is hearing people’s connections to these saints and how we are moved by them, this great cloud of witnesses. That said, I understand the disappointment when a favorite is knocked out. They are all worthy, and some who have “lost” are particularly stellar candidates for that halo. I myself was crushed when Absolom Jones lost in round 1 of all things. I hope he gets another shot. So much depends on the match-up. At the risk of being labeled a Kitsch Krank, I would like to express my sadness that the kitsch this year is simply Not. Very. Kitschy. Where are the bobble-heads? The piggy banks? The light-up bow ties? The CBs and the SEC do, to their credit, make a saintly effort in the desert of kitschlessness. I guess I will have to actively recruit some Kitsch Konnoisseurs to join us next year in order to help the truly kitschiful saints out of the first rounds. I’m as conflicted about kitsch as I am about pretty much every blessed voting choice. So I squint at what’s out there and try to remember the phrase “expressions of popular piety – it’s a good thing”, rejoice at the lack of kitsch when God has seen fit not to bring any into existence , and always ALWAYS enjoy watching the Celebrity Bloggers contort themselves to earn their vast salaries in this round. Voted for Romero but it is high time for some Flo-O kitsch. I think I will have to go design a t-shirt, dance, or song (“Do the Flo” it’s the new Harlem Shake!). Thankyou for sharing this powerful reflection on a faithful life- I have learned so much form my first year of LM! It’s odd and a little sad-making to read “PC” in today’s posts. Many years ago a (lapsed Catholic) friend of mine noted that “PC” was nothing more than what used to be called politeness or civility (such as calling or referring to people as they wished to be called or referred to with the term they preferred). Now it’s become a weapon (blunt instrument) in disagreements or arguments. After deliberation, I have to go with Abp. Romero, who has become a beacon of hope for millions in Latin America. He reminds us whose we became in our baptism and how to live as servants of the Kingdom. That said, for me Florence Li-Tim Oi is a striking example of what Hegel (had he been Anglican) might have called “the cunning of the Holy Spirit”: she was chosen to be a trailblazer in a widening and deepening of our understanding of the sacramental ministry at the heart of our common life. My thanks to the SEC (by which I do not mean the Securities and Exchange Commission) for once again enlightening us on the cloud (of witnesses) sourcing of our Christian formation! And in your prayers don’t forget to give thanks for her whom readers of “Pogo” will remember as Florence the Deadly Nightshade! You are right about “PC”. It’s like “Liberal” being treated as a bad word. The forces of darkness are at work, trying to get us to marginalize everybody but those who would take over society for their own benefit (the “I’ve-got-mine-to-H*ll-with-you” element) by calling them “losers”. Don’t get me started! Back to the subject at hand, this is a very tough choice for me, but it is truly inspiring to learn more about the “great cloud of witnesses”. Another tough choice. But as much as I want to keep supporting good women, very good women, martyrdom for others sways my vote. I’m just goin’ wit’ da FLOW…..OK, that’s the clue to my vote today. It’s really sad when one’s view is so rigid and seen with blinders on that an injection of humor can’t even creep in. Lent MADNESS is still the name of the game…bringing some lightness into the sometimes “gloom and doom” focus on Lent that turned many against it as children/youth/young adults. So maybe we weren’t dedicated enough…but LENT MADNESS has made a lot of converts and taught us a lot about those worthy of emulation during these 40 days. Although they obviously don’t want it, I’ll keep the truly insulted and disgruntled in my prayers and hope happiness will be their lot in life. I’m now gettin’ my coffee in my 2012 GOLDEN HALO/Mary Mags cup, PC or no PC. Hey, I got a sense of humor and am goin’ wi’ da FLOW !!!!! Though you hit my buttons with the Raul Julia/MST3k connection to Archbishop romero, I had to give it to the pioneering (and absolutely kitschless, which is a plus) Florence. Stained glass window from St. George’s Episcopal Church in Dayton, OH. I don’t think you all tried very hard for Florence’s kitsch . .. hope that’s not why she’s losing! Oh Scott…when I read the article about Oscar I just had to alert Stephen. You’ll understand why in a moment. It’s all my fault. Some Li-TimOi merchandise: When my class (2005) at General Seminary commissioned the writing of the icon that you feature, we were all given notecards by the artist (I am pretty sure that it was Sr. Ellen Francis of the Order of St. Helena.) Last time I checked, you could write to them and purchase note cards of Sr. Ellen Francis’ icons. Ha! Well, that will teach me to underestimate Amazon. Well played, good sir. Well played. Oh this was the hardest choice yet for me. After I voted for Florence I was glad to see that she is (so far) the underdog…at least my vote will help narrow the gap. The best honor for both will be if it’s a tight race. PS. Love the chickens in stained glass. PPS. The information on Romero was so great and inspiring. 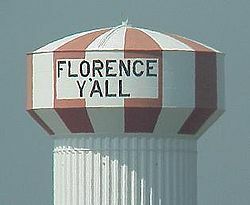 FYI: The “Florence Y’All” water tower you posted is in Florence, Kentucky, not far from Cincinnati. Located near a shopping center, the tower originally said “Florence Mall.” The tower was completed before the mall, however, and legal issues arose regarding advertising a nonexistent mall. The mayor’s solution was to change the M to Y’, and it has stayed that way since 1974. Megan, love the write-up! I love the ROMERO film. Have seen it multiple times. It is hokey but somehow still so moving. This one was hard, but Romero still tugs on my heart that much more strongly. That was rather sobering kitsch for Oscar Romero. I was going to go for Florence, even if she did stick it to that nice Chad of Lichfield. But after following the link to the Romero Trust I changed my mind. The relics are rather gruesome but viewing them makes Bishop Romero much more real. I have enjoyed learning about Florence and appreciate her dahlia. And how cute is the photo of her sister at 95. 95?! Oscar Romero’s name appears on one of the small, white, wood crosses standing amidst the rose bushes near the front door of Mission Santa Clara, California. A simple reminder of modern martyers. Lent Madness made me nuts again and while I wanted to vote for Romero for his evident love of the people, I’m finding myself bothered more and more by the skeletons falling out of the Vatican’s closets. So you would think I would throw a sympathy vote to a man evidently betrayed by his own. Instead I will stay with my Anglican roots and all the other reasons I have given earlier for voting for Florence. Yep. It’s Flo Y’all for me … Still. For those of you who speak Spanish, here is a song that came out for the 25th anniversary of Romero’s martyrdom, Profetas by Amor et Verdad. It talks first about Isaiah, the John the Baptist and, finally, Romero. The refrain states that prophets cannot be silenced for the message of God that burns in their hearts. In 1984 I was one of several students from General Seminary who attended the 40th Anniversary celebration of Florence Li Tim Oi’s ordination at West Minster Abby. She did so much, and was mistreated by her church. But she did not become bitter. I admire her greatly. A priest with a Nightingail link–now that’s a calling. Florence all the way. Has anybody else considered that the Curia may have appointed a bishop from South America as Pope in order to increase Romero’s advantage? Worth investigating, I think. ps: Keep the Kitsch Koming.